There was no official Red Ensign and I have seen no record of there ever having been any unofficial Red Ensigns with this badge. The badge was introduced on the Blue Ensign and governor's Union Flag in 1875 for Trinidad. Tobago was administered as one of the Windward Islands and had had its own badge since 1870. In 1889 Tobago was annexed to Trinidad and the former badge of Trinidad became the badge of Trinidad & Tobago. Used until 1958 when it was replaced by the same scene contained within a shield shape, the motto being on a scroll beneath the shield. It appears the Trinidad badge is really old, and it appears on a blue ensign. Later, in 1889, it became the badge of T&T, again in a blue ensign, to be changed once more only. Trinidad used a circular seal in 1875 flag. It was changed to the arms of Trinidad & Tobago in 1958. This image is based on photo of a red ensign taken by Dov Gutterman at a flag display in ICV 19 (York, July 2001). 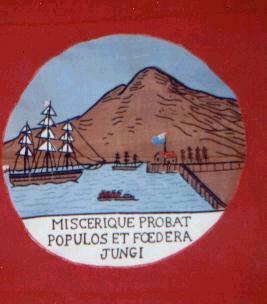 The origilal flag is from Clay Moss collection. According to the display catalouge: "The badge is an example of a seal rather than coat of arms. The motto reads: "She is content to make treaties and unite peoples." This version may have been unofficial or its origin is not clear. Version of the Trinidad & Tobago Colonial flag of 1958, based on the badge at this page and the description of Mr. Prothero. The scroll shape is entirely hypothetical. Former flag of Trinidad and Tobago, adopted in 1959. The Queen HAD personal flags for Trinidad & Tobago but this is now no longer in use as the country is a republic. The ships are one over two, and I think I saw this flag in one of my books. The blue disc interferes heavily with the topmost ship, IIRC. Illustrations of this flag are in Barraclough (1969 edition), plate 5, #8; and in FTTAAATW, p. 288. The badge almost entirely obscures the topmost ship. The catalouge of the flag display in ICV 19 (York, July 2001) says: "Once more the personal emblem of Her Mejesty defaced the arms of the country. The colours are those of the nationl flag, red with a white-bordered descending black diagonal. The hummingbirds represent the two islands and the three ships are those of Christopher Columbus". The first date should be the date, not of independence, but of the first visit by the Queen after independence. Entirly standard flag as far as I know. I wonder weather "&" was written on the flag or if verbosely "and" was possibly used. This is the badge for Trinidad and Tobago. It is the same as the badge that had served for just Trinidad since c1875. It continued unaltered until c1958, when the same scene was put into a shield and the motto moved to a scroll below the shield. I guess that this was the shield of the arms that were granted 13 Oct 1958. According to the Royal Commonwealth Society Library Notes these arms are illustrated on page 32a of the Colonial Office "Flags,Badges and Arms" part II. The 9 August 1962 arms are the currant CoA. 1965 atlas printed in Yugoslavia show Trinidad and Tobago have a flag identical to Upper Volta. It should be noted that black, red, and white are the longstanding colors of the country, even before the current national flag was adopted, as it was based on the coat of arms. Thusly many local flags use these colors, and one of them might have confused the authors of [y9u65], published shortly after the adoption of the flag (1962). One of such red, white, and black flags is that of Point Fortin Borough Corporation .